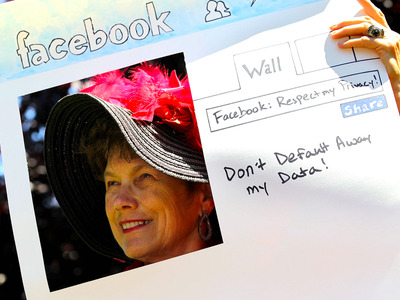 GettyA woman protests against Facebook. Facebook has revealed all the ways it records information on users. The disclosure was made in a deluge of answers to US Congress following CEO Mark Zuckerberg’s appearance in April over the Cambridge Analytica scandal. Some were unsurprising, such as the time people spend on Facebook or whether they buy things via the site, but others shed light on the sheer scale of Facebook’s monitoring machine. Facebook records your mouse movements. This helps the company recognise that you are not a robot. Facebook also knows your mobile operator,internet service provider, and IP address, as well as your cookie data,time zone, and internet connection speed. The signals of your device are also monitored, including Bluetooth and information about nearby Wi-Fi accesspoints. Nearby “cell towers” are also known to Facebook. Facebook hoovers up your GPS location,camera information, and photos if you don’t lock down your settings. Call logs and SMS log history are also recorded if users choose to sync their Android devices or upload data. Data about your “online and offline actions” and purchases from third-party providers is collected, in addition to information about the “games, apps, or accounts” people use.